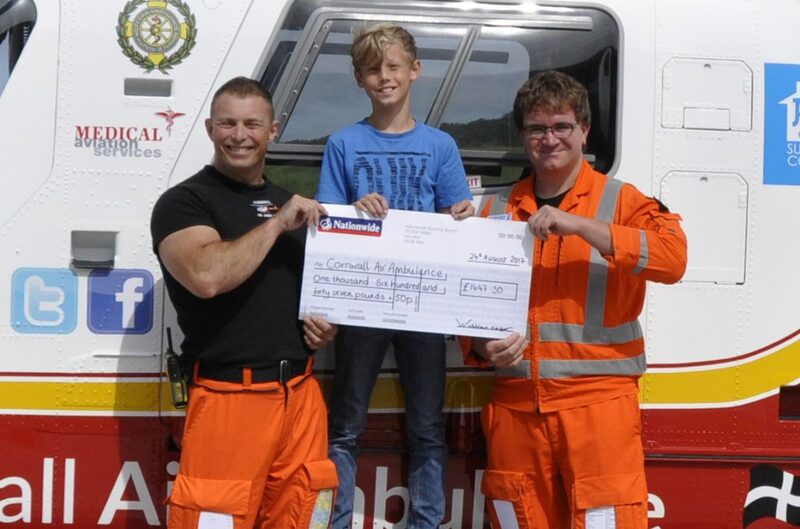 10 year old William Taylor has been fundraising for Cornwall Air Ambulance, setting out to complete a static cycle ride the equivalent distance to riding from Newquay to Derriford Hospital and back spread over 3 days. The symbolic journey has a special meaning to William, as he was air lifted from Newquay and taken to Derriford Hospital in June of this year. He set up outside the Newquay Cornwall Air Ambulance shop during Boardmaster’s weekend with his static bike and donation buckets. Although he set out to ride the distance from Newquay to Derriford Hospital and back, enthusiastic William ended up cycling approximately 160 miles – around 50miles further than he planned. Generous supporters cheered William on and a fantastic £1500 was raised for Cornwall Air Ambulance. William’s fundraising idea was sparked after he was air lifted by the crew following a training injury. A talent gymnast, William trains at Kernow Gymnastics in Newquay and was performing a front flip into a round off to a back flip when the incident occurred. The crew were called to assist and William was taken to Derriford Hospital. On arrival, he had to be sedated while they straightened the bones in his arm to ensure they healed properly and he could continue to train in the future. William was told his cast would come off in September, but had it removed early due to speedy recovery. He has won several competitions in gymnastics, including 2 gold and 1 bronze medal in March and he also won the trophy for Best Overall Gymnast at the Men’s Acrobatic Gymnastics Association competition.